In honor of the one year anniversary of The House in Fata Morgana‘s English release, we have some comments from the developers! 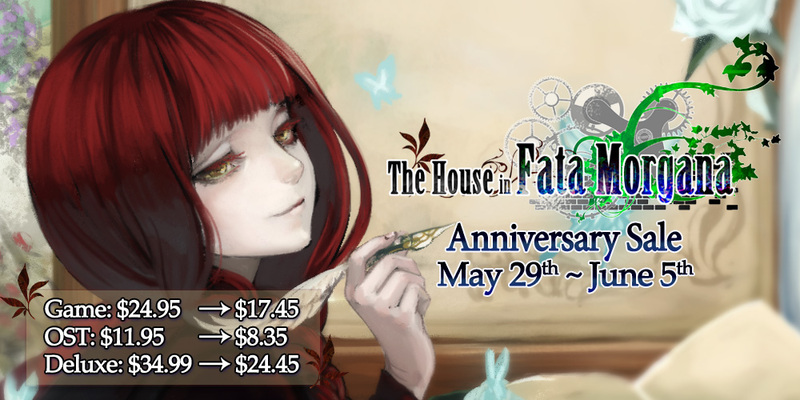 Surprisingly enough, it’s been one year since The House in Fata Morgana launched on Steam and MangaGamer’s website! When it first went on sale we were worried about whether or not everyone would enjoy our work, but it turns out that we didn’t need to be at all. It is thanks to all of you that this title continues to spread. Because of your appreciation and recommendations to friends, the flames of this story burns ever brighter. We hope that everyone will continue to support us in the future, and the overwhelming gratitude we feel will be accurately conveyed to you in our next work. It will be a product related to The House in Fata Morgana, but also a new product for us at Novectacle. We thank you all for your constant encouragement, from the bottom of our hearts. You can pick Fata Morgana up right now on our website or Steam for 30% off!